Slow roasting at low temperature warms this ham through and allows the luscious glaze to coat it in warm flavors of bourbon and orange with a touch of cinnamon. 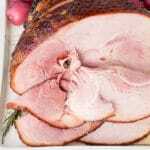 The low temperature keeps the ham moist and tender. Preheat oven to 325 degrees. Fit a large baking sheet (with sides) or baking dish with a sturdy flat rack (not a V roasting rack). Place the ham, cut side down, onto the rack. Pat dry with paper towels. Combine all glaze ingredients together in a medium saucepan over medium-high heat. Bring to a boil and allow to boil for 4 minutes. Remove from heat and discard cinnamon stick. Brush the ham with the glaze (it won’t be thick yet but will thicken as it cools). Allow to sit for 5 minutes and brush with glaze again. Place ham in the oven and bake until it reaches 120 degrees internal temperature measured in the thickest part away from the bone (approximately 1 hour to 1 ½ hours depending on the size of the ham). Brush with glaze approximately every 15-20 minutes until the glaze is gone; brush between the slices of ham to if possible. Allow to rest 10 minutes before serving.